Money Smart Week is March 30-April 6, 2019. 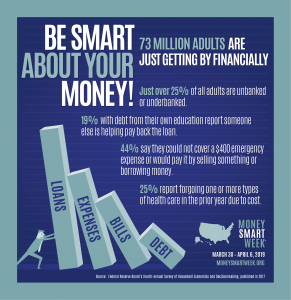 Money Smart Week is a program started by the Federal Reserve Bank of Chicago and other Chicago-area organizations in 2002 to help consumers manage their personal finances better. Programs are for everyone and Money Smart Week has expanded to every state. Programs take place in many public libraries, schools, universities, and community centers. To find out more about this initiative and see what programs are taking place in your area, check out the Money Smart Week website. At the Boston Public Library, we have a great line-up of programs during Money Smart Week for children and adults. This list will get you started with organizing your finances and beginning to invest.